Which Awning Material is Right for You? When it comes time to pick out an awning for your home or business, you must first decide which material you want! You’ve finally decided to invest in an awning for your home or business. This is a great decision because it provides an aesthetic appeal while also protecting your interior from the harsh sun rays. Once you’ve made the decision to install an awning, you must then decide what material you want it to be made of. 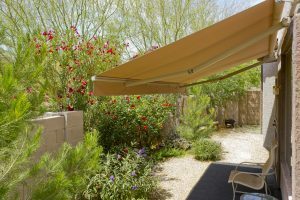 Here are some common awning materials to help you decide which is best for you. With an acrylic fabric, you have the choice of one that is 100% acrylic or one that is combined with another awning material like polyester or cotton. Acrylic is a lot more sturdy than traditional canvas fabric. This material also helps to reduce fading and repels water from the awning. It is good for areas with high humidity as it provides sun protection and helps to keep mildew from growing. This awning material is heavier than acrylic, giving it a little more durability. The vinyl material is known for their translucency which makes it an ideal material to use if you want your awning to be illuminated or backlit. Like acrylic, It is also a good choice for areas of high humidity because it does a good job of resisting UV rays. However, vinyl awnings have less style choices than acrylic. Metal awnings will provide a different look for your home or business. They are more sturdy than the first two because they aren’t made of fabric. However, steel awnings need repainting regularly to keep it from rusting and aluminum is easy to dent. They also need to be cleaned more carefully than fabric. These awnings can’t be rolled down, but some come with hinges or you could invest in a retractable awning. This awning material is more similar to metal than the other two, but it is a more lightweight option. You don’t have to worry about painting fiberglass because it is made with the color already in the material. These awnings can be translucent, so they also allow some light in. Fiberglass awnings tend to become brittle over time, so they might need to be replaced more often than the other options. Contact Carroll Awning Today for Your New Awning! Ready to get the perfect awning or canopy for your apartment building, business, or home? Carroll Awning Company has the expertise and equipment to make and install the perfect residential or commercial awning to give your home or business an even cooler exterior. We can design, create, and install custom canopies and awnings all year long. For a free estimate and to get started designing your dream awning, give us a call at 1-800-999-5617 or visit us online. To see examples of our work, follow us on Facebook, Twitter, Google+, and LinkedIn.